Climb on the Bungee Run, put on the harness, grab the velcro marker and charge down the inflatable as far as you can before B-O-I-N-G you're flying backwards! We have this game in both single lane and twin lane versions as well as the alternative Bungee Eliminator and the four player Dash n Grab. See how far you run down the Bungee Run against the resistance of the bungee ropes before you run out of strength and you're sprung backwards. Players normally get to make three attempts to see how far along they can place there velcro marker pads. The Bungee Run is great for participants from age 8 to adult. Please note that it's not really suitable for those younger than 8 as they don't really have the size or strength to stretch the bungee cords sufficiently. These inflatables are suitable all types of event: fetes, shows, fun days, corporate events and birthday parties. Great fun to watch and it's always very competitive to see who can place their marker the furthest down the inflatable. The single lane Bungee Run requires an overall operating space of 40ft long x 8ft wide and a height clearance of 10ft. The double lane Bungee Run needs 45x12x10ft. 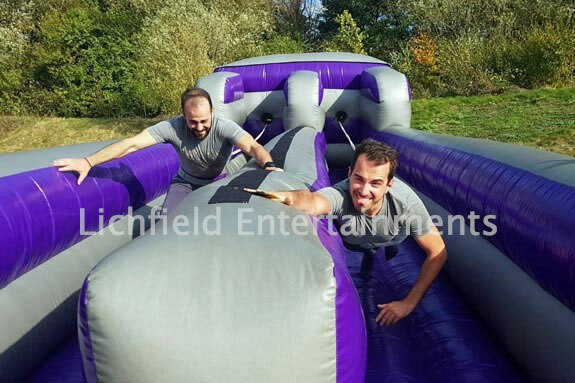 If you have any queries, questions, or would like to hire the bungee run for your event please click here to enquire and we will do all we can to help.